When you think of needle arts, do you picture a little old lady in a rocking chair, knitting and purling? 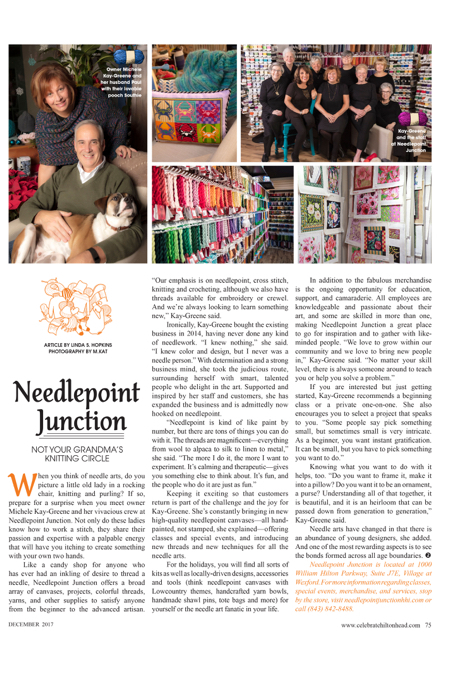 If so, prepare for a surprise when you meet owner Michele Kay-Greene and her vivacious crew at Needlepoint Junction. Not only do these ladies know how to work a stitch, they share their passion and expertise with a palpable energy that will have you itching to create something with your own two hands. Like a candy shop for anyone who has ever had an inkling of desire to thread a needle, Needlepoint Junction offers a broad array of canvases, projects, colorful threads, yarns, and other supplies to satisfy anyone from the beginner to the advanced artisan. “Our emphasis is on needlepoint, cross stitch, knitting and crocheting, although we also have threads available for embroidery or crewel. And we’re always looking to learn something new,” Kay-Greene said. Ironically, Kay-Greene bought the existing business in 2014, having never done any kind of needlework. “I knew nothing,” she said. “I knew color and design, but I never was a needle person.” With determination and a strong business mind, she took the judicious route, surrounding herself with smart, talented people who delight in the art. Supported and inspired by her staff and customers, she has expanded the business and is admittedly now hooked on needlepoint. Keeping it exciting so that customers return is part of the challenge and the joy for Kay-Greene. She’s constantly bringing in new high-quality needlepoint canvases—all hand-painted, not stamped, she explained—offering classes and special events, and introducing new threads and new techniques for all the needle arts. For the holidays, you will find all sorts of kits as well as locally-driven designs, accessories and tools (think needlepoint canvases with Lowcountry themes, handcrafted yarn bowls, handmade shawl pins, tote bags and more) for yourself or the needle art fanatic in your life. Knowing what you want to do with it helps, too. “Do you want to frame it, make it into a pillow? Do you want it to be an ornament, a purse? Understanding all of that together, it is beautiful, and it is an heirloom that can be passed down from generation to generation,” Kay-Greene said. Needle arts have changed in that there is an abundance of young designers, she added. And one of the most rewarding aspects is to see the bonds formed across all age boundaries. Needlepoint Junction is located at 1000 William Hilton Parkway, Suite J7E, Village at Wexford. For more information regarding classes, special events, merchandise, and services, stop by the store, visit needlepointjunctionhhi.com or call (843) 842-8488.